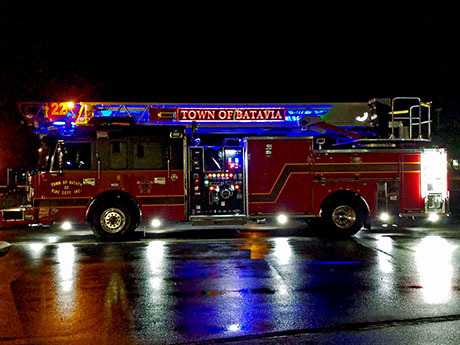 The Fleet | Town of Batavia Fire Department Inc.
Town of Batavia Fire Department Inc. Built in 1996 by 4 Guys this vehicle had a stainless steel body. It had a 1250 Gallon Per Minute (GPM) single stage pump and a 1000 gallon water tank. It served as our front line engine for many years before becoming a reserve engine later on in its’ tour of duty with us. 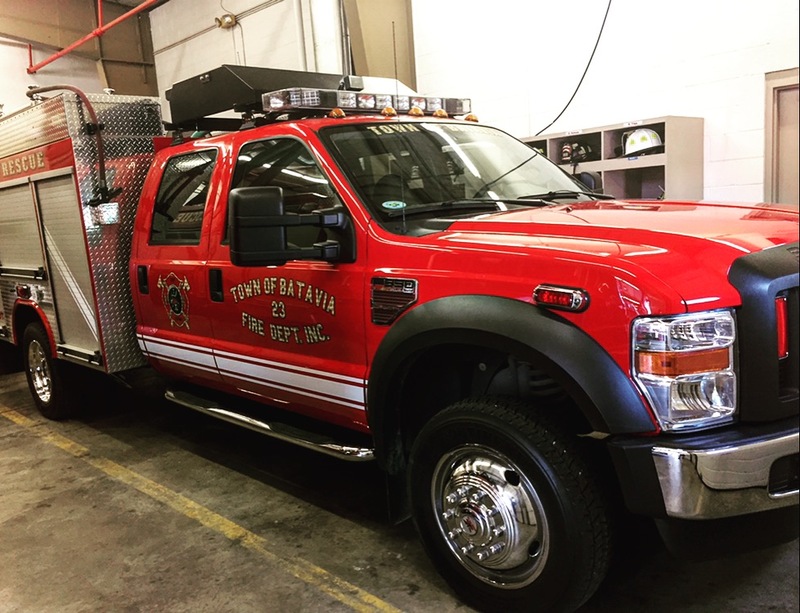 It was sold to the Gerry, NY Fire Department in 2017. Built in 2002 by 4 Guys, Rescue 20 has a stainless steel body and serves as a Heavy Duty rescue unit. 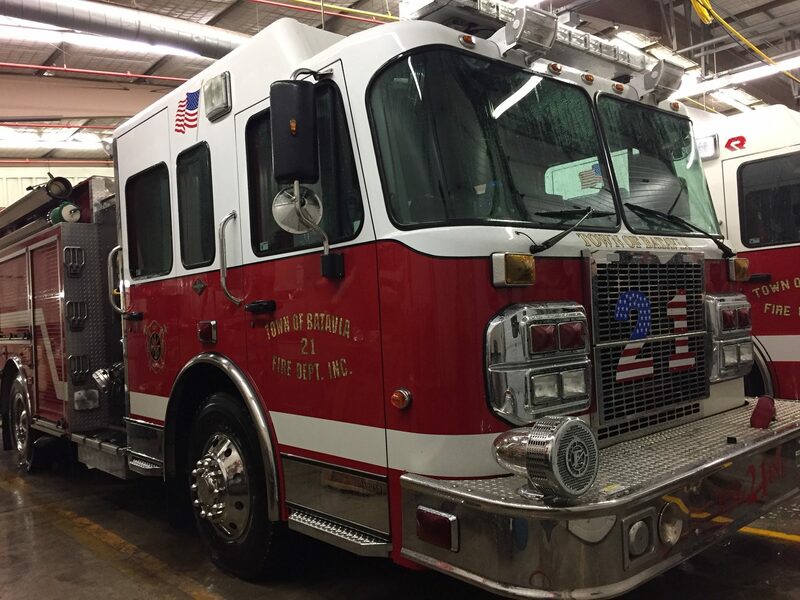 It is housed at Station 1 and it is equipped with a light tower, generator as well as a TNT electric power system which powers two 100ft pre-connected hydraulic hoses for extrication equipment. It holds a variety of equipment including a Petrogen oxy-gasoline cutting torch, an Exothermic cutting torch, ventilation fans, rescue 42 jacks, high and medium pressure air bags, and a large quantity of air bottles to name a few. This unit is equipped to respond to Rapid Intervention Team (RIT) or Firefighter Assist and Safety Team (FAST) calls. Built in 2006 by 4 Guys and is currently housed at station 2 on the east side of our district. 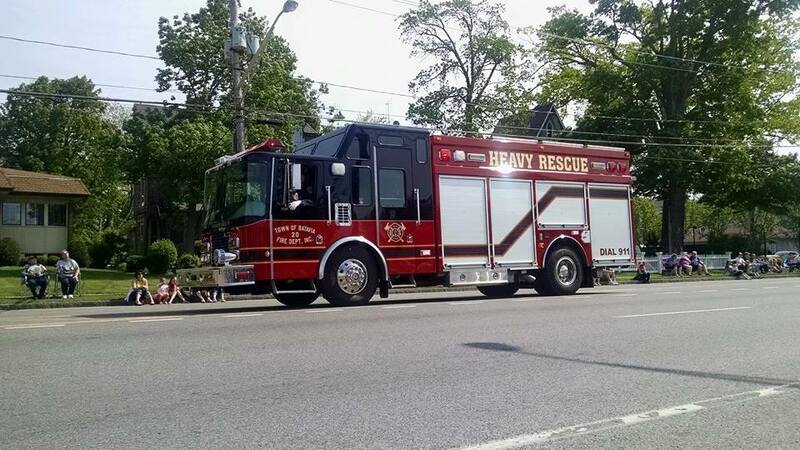 This vehicle has a stainless steel body and It carries a 1500 Gallon Per Minute (GPM) Waterous pump, with a Hydro/Foam Pro class “A” foam system and has a 1000 gallon water tank. It is also equipped with a deck gun. 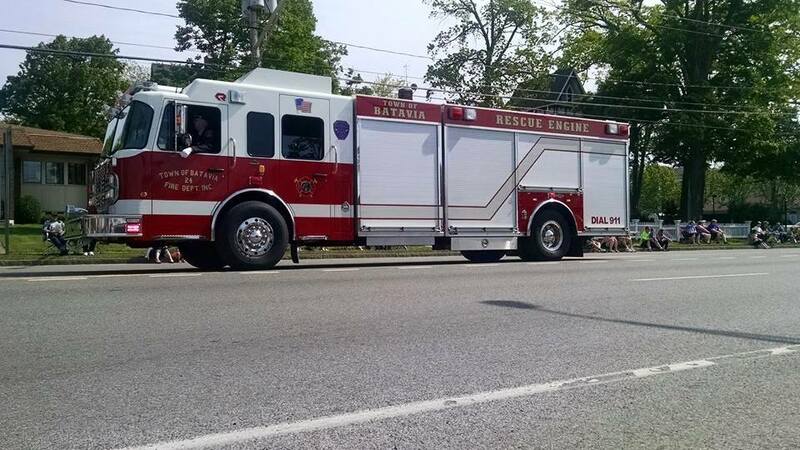 Built in 2017 by Spartan ERV, this truck has a 75′ ladder and caries 480 gallons of water and 20 gallons of foam. It has a 1500 GMP pump and two 2″ attack lines on the front bumper. Housed at Station 2, this truck is first due to all alarms of fire in our district. 2010 Ford F550 built by Fouts Brothers Fire Equipment. Has a 375 GPM pump and a 300 gallon tank. Serves as a quick response vehicle for grass fires. Also serves as a our traffic control vehicle. It carries an assortment of traffic control equipment, signs, cones and also has a lighted directional traffic arrow. 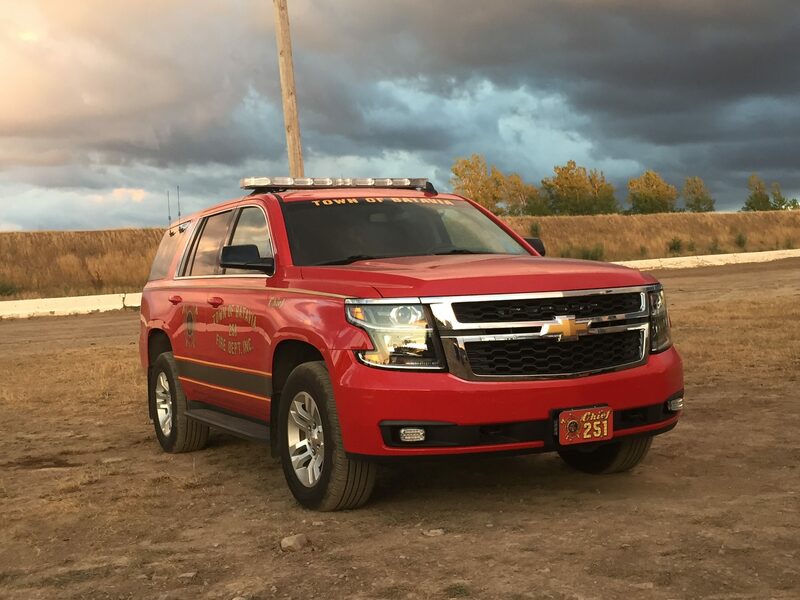 2008 Rosenbauer, this multi-purpose vehicle has a stainless steel body and can serve as an Engine or as a Rescue unit out of station 1. It carries a 1500 Gallon Per Minute (GPM) Hale single stage pump with a class “A” & class “B” foam system. This includes a 1000 gallon water tank, a 25 gallon class “A” foam tank, and a 50 gallon class “B” foam tank. 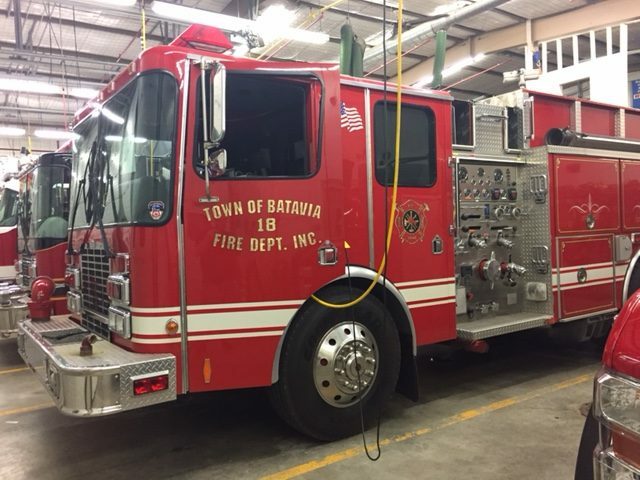 It is equipped with a light tower, generator, a deck gun, and has a “TNT” electrical power system with two 100 foot pre-connected hydraulic hoses for extraction tools. It also carries medium presser air bags for lifting and has “Rescue 42” struts for stabilizing vehicles. This unit is equipped to respond to Rapid Intervention Team (RIT) or Firefighter Assist and Safety Team (FAST) calls. 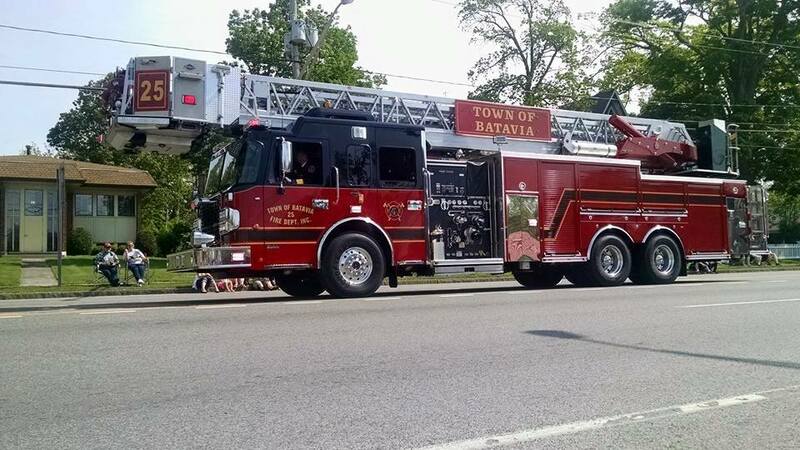 2013 Spartan ERV, Ladder 25 is a 100′ aerial platform truck. It has a 2000 GPM pump and a 300 gallon water tank. Housed at Station 1, Ladder 25 carries an assortment of ground ladders ranging from 16′ to 35′. It also carries multiple ventilation fans, saws and other forcible entry tools. It has two master streams that can be run simultaneously as well as being able to provide elevated scene lighting. The truck also has the ability to preform below grade rescue operations.